After spending some time reflecting on my adventures.. 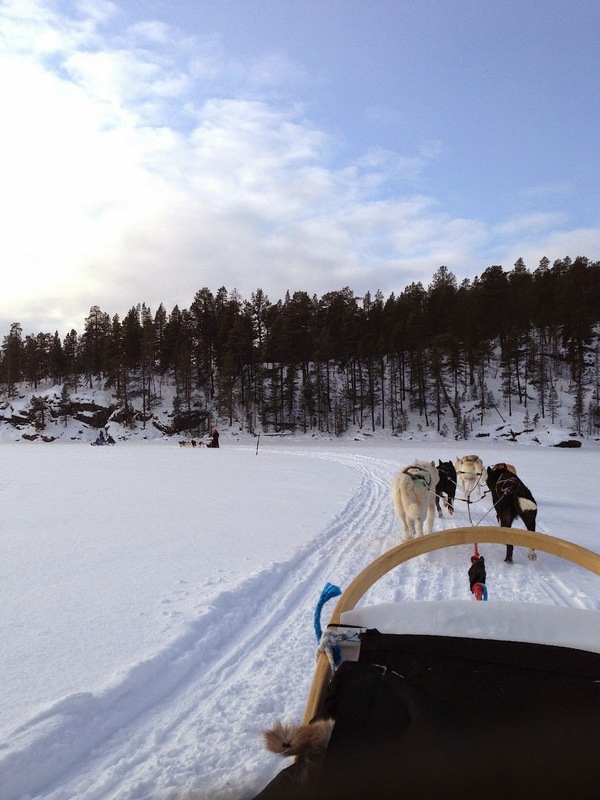 I realized that the Husky Sleigh Ride in Inari, Finland was the second most amazing travel experience I've ever had. It was not in my Bucket List, but go add it in yours! 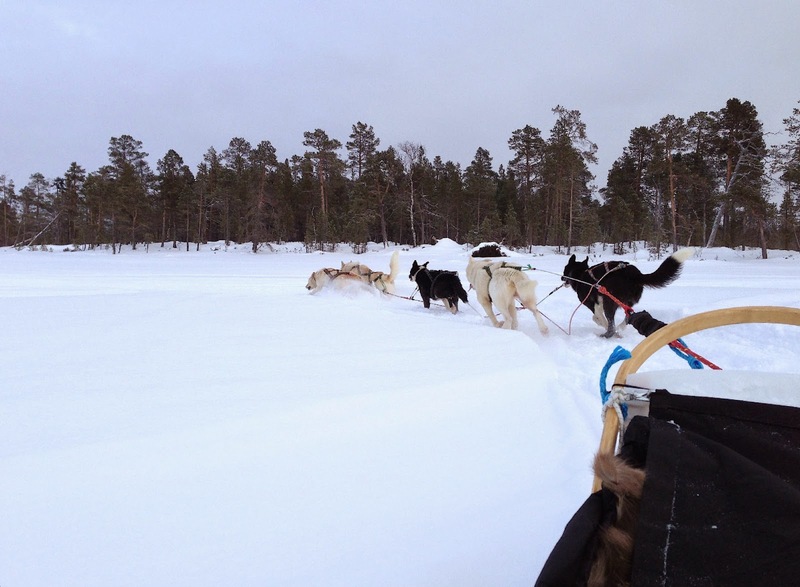 In the Finnish Lapland, they often call it Husky Safari..
Tours are readily available with most of the hotels.. 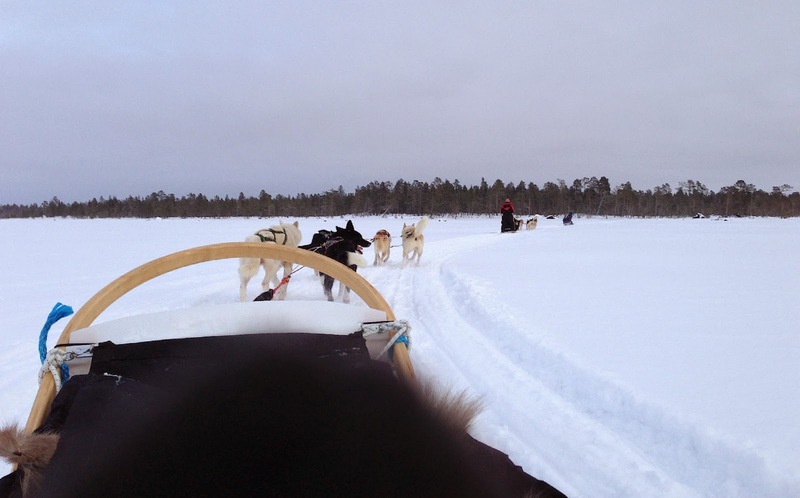 But it would be better to book them in advance because, first, the dogs are limited, and second, the sleds have to be prepared. 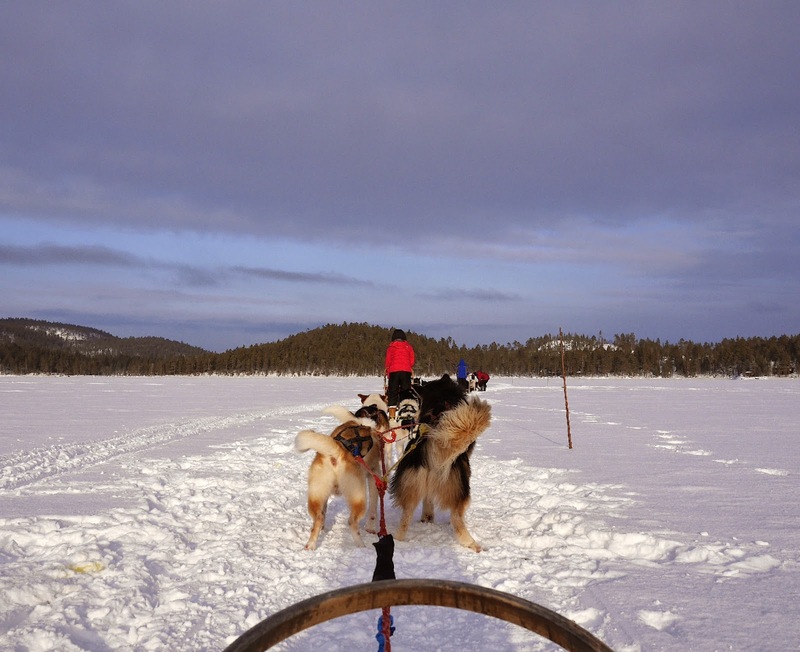 And now we are here at the farm.. By the frozen Lake Inari.. Walking through the woods... And wow!!! There they are! All ready and waiting for us! Thought I'd only see this in the movies! 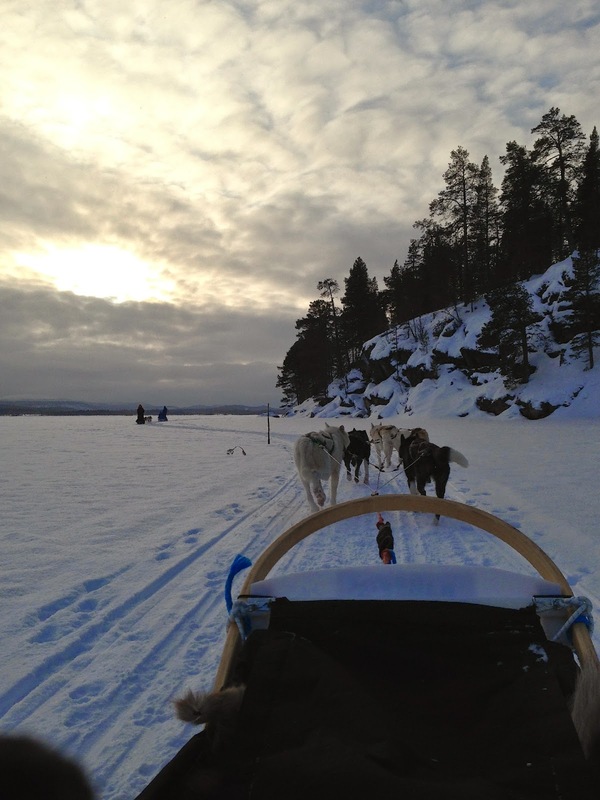 In pairs, we choose our sleds.. It has 5 to 6 huskies each.. with different genders because they have to mix and match the alphas.. Showing us how it's done..
One person has to stand and step on, and control the brakes from behind, while the other..
We are ready.. and the huskies can no longer wait to have fun! 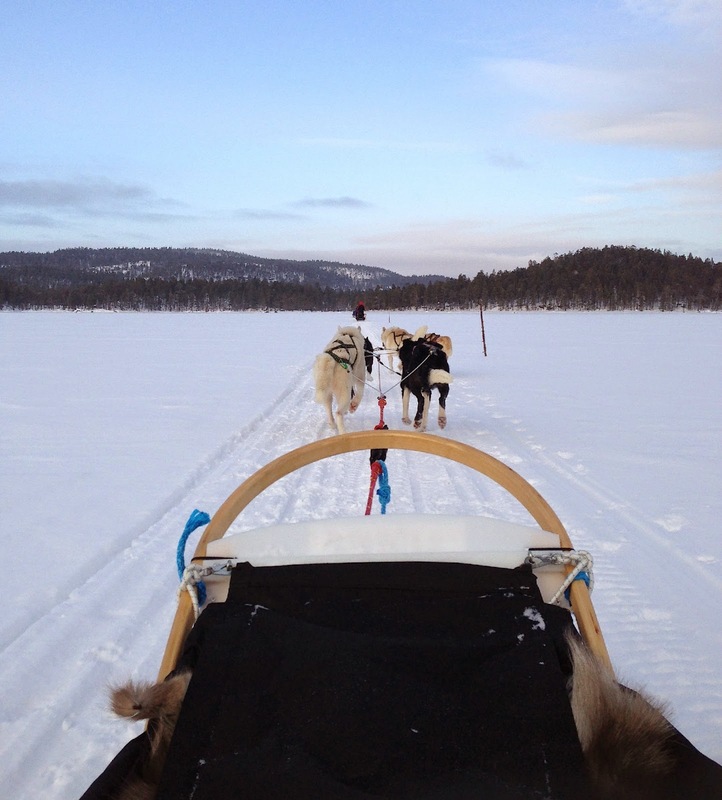 The guide starts to release the dogs.. while we continue to step firmly on the brakes until our cue.. 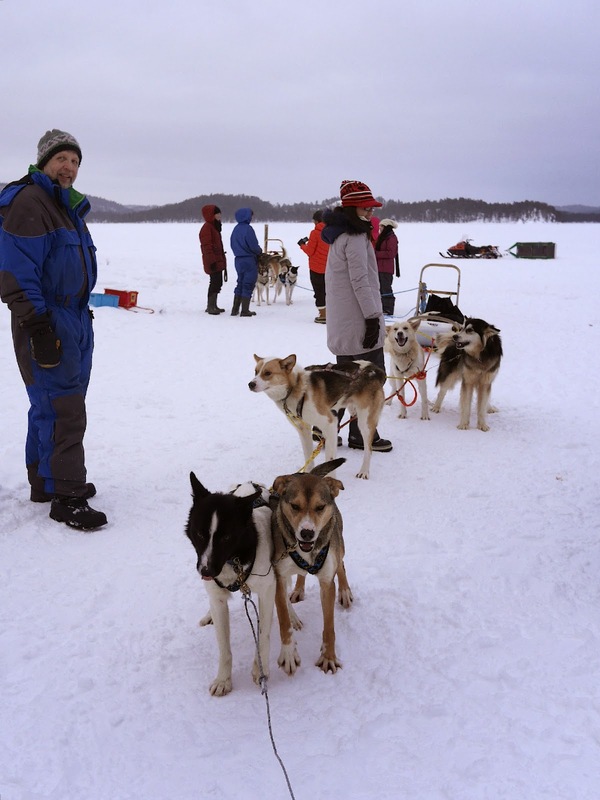 Following the guides on the snowmobile..
One sled at a time, we release our brakes to let the dogs run and form a single row.. 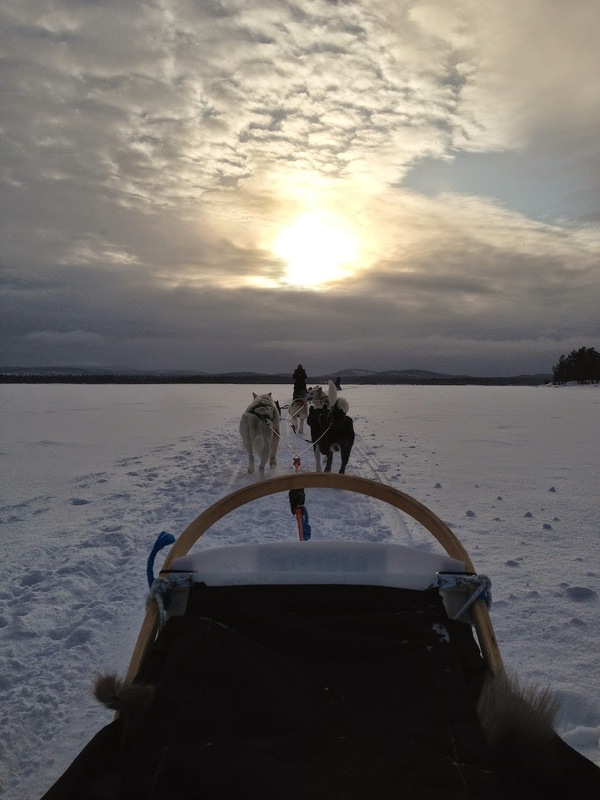 The dogs are well trained.. they follow a path.. and they know that they have to follow the snowmobile or sled in front.. 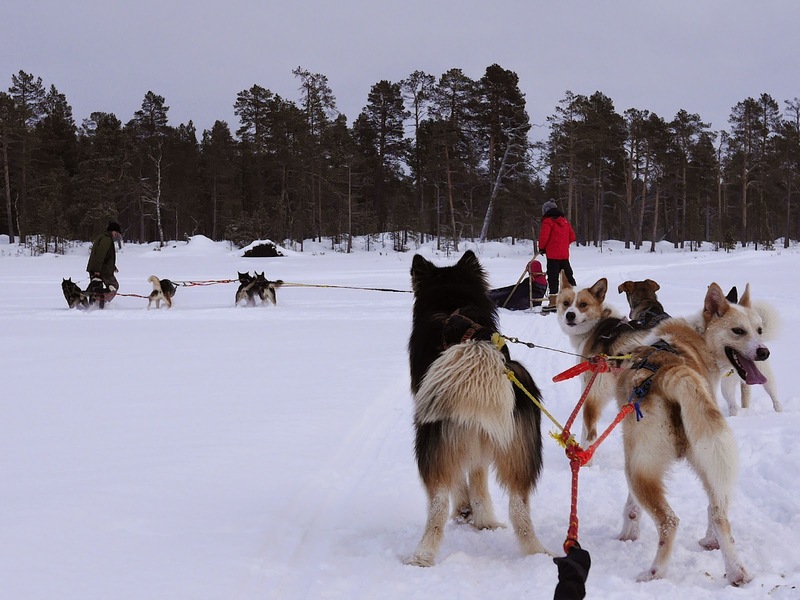 The guides have to fix some of the dogs or sleds.. put them back on track.. run back and forth.. untangle ropes.. check each one.. 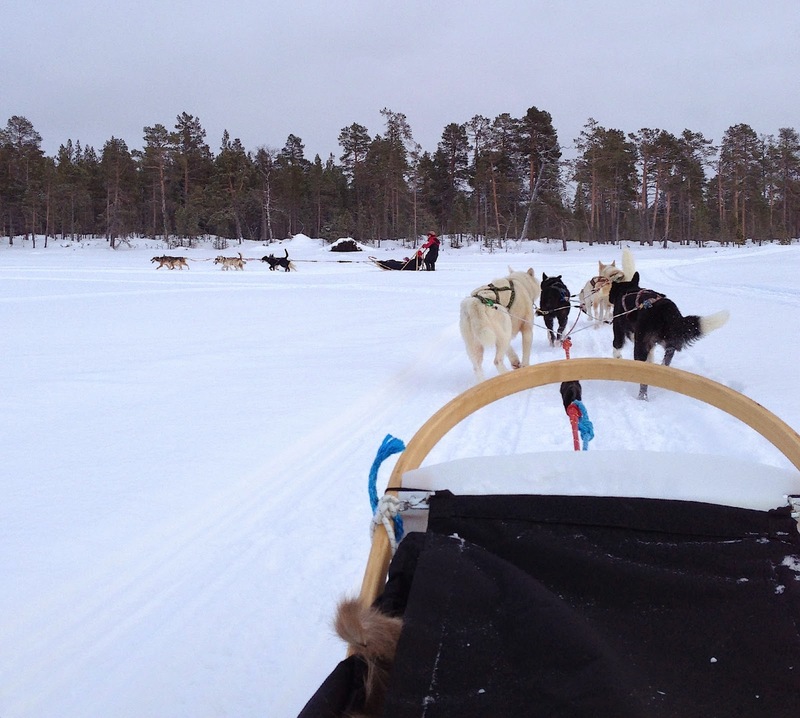 There are 10 of us.. 5 sleds.. and at least 26 dogs! It is not an easy task for the guides to be handling so many animals all at the same time..
We are all waiting.. and waiting.. and it's getting really cold..
Our dogs are starting to get bored.. restless.. and horny!! Our dogs just started mating!! So now we have to wait again.. and no.. I am not joking! I can't describe the feeling properly anymore.. Cold.. exciting.. amazing.. overwhelming.. !! Sitting comfortably, I am hanging on to our camera and waiting for these moments.. The huskies are doing what they love.. running.. really fast! Feels like I'm just dreaming.. Riding towards the very beautiful setting sun.. Crossing the vast snow-covered frozen lake.. The guide is pulling them back..
Back on the path now.. 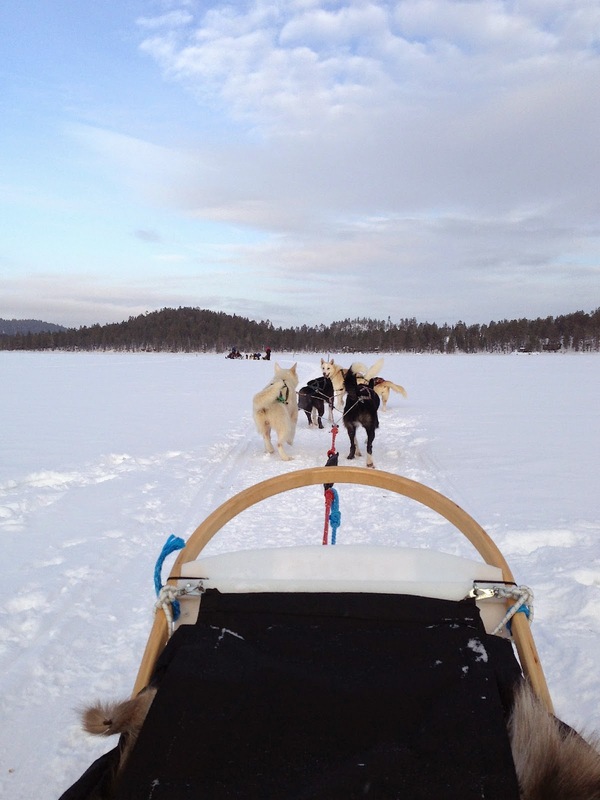 The guides are checking all the sleds again..
Our fairy tale adventure continues.. Feels like heaven.. and loving every moment of it!! They are tired now.. and heading back to their houses..
A squirrel is curiously watching..
And getting their reward - some Reindeer bones! 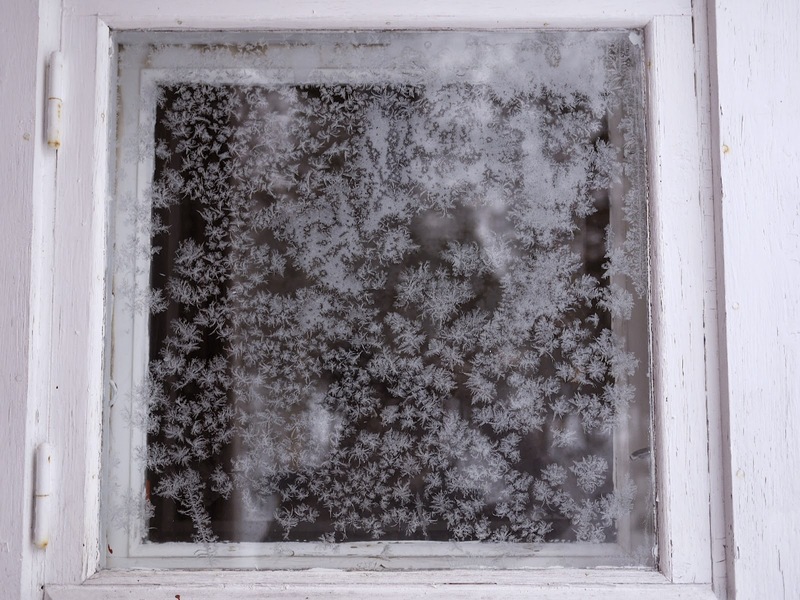 Just a window frost on the way..
To the teepee where everyone has gathered for some hot lingonberry juice.. 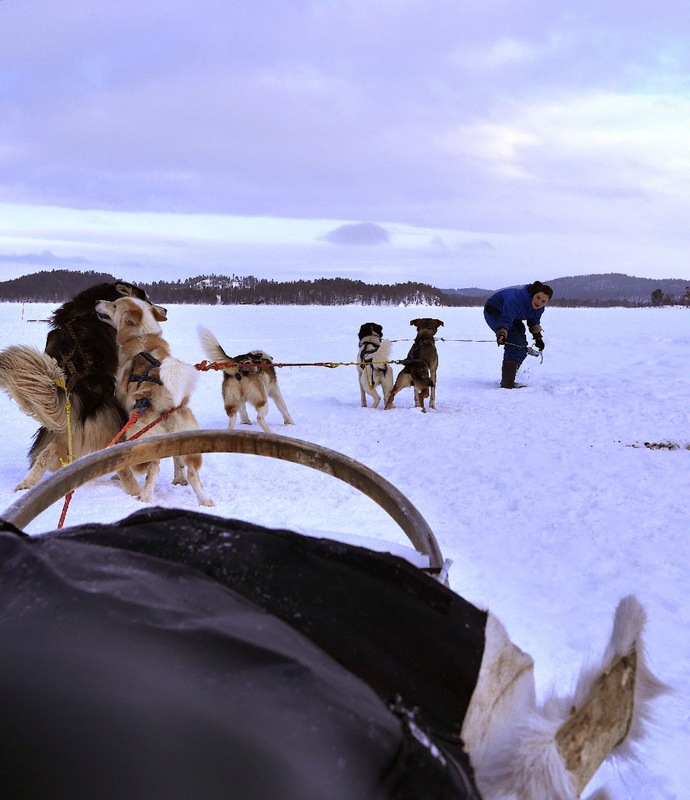 Sharing stories, keeping warm, grilling sausages..
And getting dirty eating those blackened meat..
Also check out: Reindeer Sleigh Ride, Northern Lights Over Lake Inari, and First Glimpse of the Arctic Circle. Enjoy!